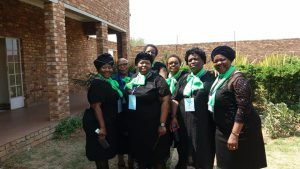 The Mothers Union of Highveld Diocese chose to wear black and green during 2018 Conference. This is to symbolize their commitment to two themes – Combatting gender based violence and caring for the planet. As Mothers Union, we are called to care for families, and so we are responsible for the future of our the planet that we leave for our children and grandchildren. So we must make choices in our lives “awuboni indlela zimbini? Hey Wena – khetha eyakho?” Do we buy bottled water which leaves plastic for generations to come? Or serve water in glasses and wash them up. Do we eat, travel, life in a way which damages the earth or choose the alternative which is healing the earth? The Provincial MU has banned the use of Styrofoam and yet we still are often using it at a parish level. Let us be healers of the Earth. The Conference was blessed by the presence of Canon Terrie Robinson, who coordinates the International Womens network of the Anglican Communion, who shared the some of the gender challenges faced.